Construct a truly striking holiday display by including this wintry nail ornament. 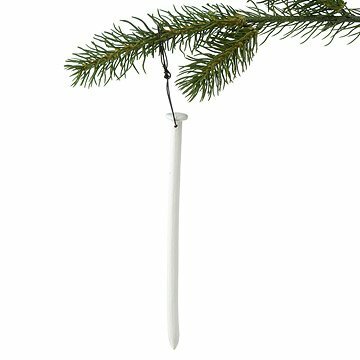 An industrial twist on traditional decorative icicles, the high-fired porcelain ornament is slip cast from a galvanized spike nail commonly used to secure rail road ties, and hangs from a 2" loop of galvanized steel. While this nail won't actually add more stability to a leaning evergreen, it makes a great gift for woodworkers, contractors and all types of do-it-yourselfers. Handmade in Portland, OR. With a desire to work with her hands, Lisa Jones formed Pigeon Toe Ceramics with a vision to design uniquely beautiful objects. From their base in Southeast Industrial Portland, the artisans and visionaries at Pigeon Toe produce works of art that are meant to become heirlooms, not "hassles." With a strong sense of ethics and quality control, Jones created a collection that brings only the finest hand-crafted products into the home - products that are modern but, nonetheless, timeless. Every harmonious piece has its own personal value, function and aesthetic appeal, "Because life is too short to be surrounded by anything less than beautiful." And beauty comes in many forms, so there are always new objects to discover and a story to accompany each one. Approx. 7" L; 6 oz. Porcelain Nail Ornament has been discontinued. When it sells out, it will no longer be available. I know it's unorthodox to write a review before ordering an item, but here it is anyway (I might forget later) and this is definitely going into my Cart. I'll be giving this to my son and his wife this Christmas in commemoration of their first new stick-built home that they will be moving into on August 1st. I'm happy it's white as it will easily be seen among green boughs. I gave it 5 stars based on the reviews stating the wonderful service this company gives if something is broken when received. This would also make a cute gift for someone to give to their builder, woodworker, handyman, etc. To me, this ornament represents the nails that pierced Jesus to save us from our sin. We own several nail ornaments to remind us of the true meaning of Christmas. Really? I wish this porcelain nail ornament came in different colors, like zebra stripes or rainbow. It's far too dull in just white. I suppose for you minimalists this is the best tree ornament ever. But! I am now inspired to start my own line of minimalist ornaments such as paper-clips painted with white-out, sticky-notes on a string, and used envelopes crumpled into twisty shapes, that you'd stuff in between the branches. Handmade porcelain ornaments shaped like railroad nails.